First, you want to start with a “clean” yard. Your yard should be free of branches and other debris and should be mowed, weed wacked and edged. You can make your yard appear even more meticulously landscaped by lining your gardens with mulch or small stones and creating borders for those gardens with larger stones, brick, pavers, wooden borders or plastic edging specifically made to bend around rounded gardens. Then you want to add your flair – flowers and plants. We are lucky to live in Florida because there are so many colorful, vibrant options from which to choose. Want a plant with big beautiful glossy leaves that will thrive year after year? The zeezee plant is a hearty perennial that can grow up to four feet high and three feet wide. The zeezee is also great because it tolerates little light and water. Ferns are also perennials that need very little fuss and grow well in the shade. Some other pretty plants that flourish in Florida are the pineapple guava, saw palmetto, fire bush and yucca. There are a host of bulbs and tubers create year-round floral enjoyment in Florida, including caladiums, which have heart-shaped leaves and come in pink, white, red or burgundy. African lilies can also add a wonderful tropical flair to any Florida garden. Plant them, and look forward to large green leaves with beautiful clusters of blue or white flowers. Some other lilies that flourish in Florida are Aztec lilies, blood lilies, the kaffir lily, spider lilies and rain lilies. Amaryllis, irises, elephant’s ear, dahlias and gladiolus are also great options. 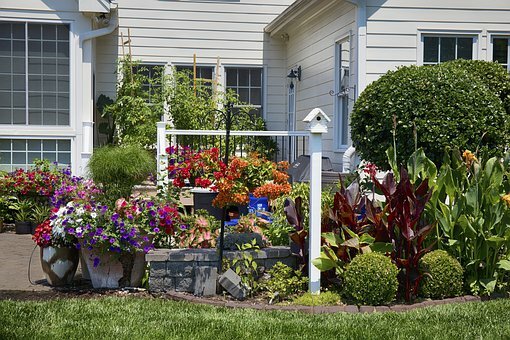 Flowers and plants can dramatically and inexpensively enhance your front yard. So go ahead and liven things up out there! You’ll make your neighbors smile, wow your guests and get top price for your home when you want to sell it.